HSDiagnomics provides a complex service to customers, starting normally from genomic DNA extracted from blood, tissues or FFPE samples. 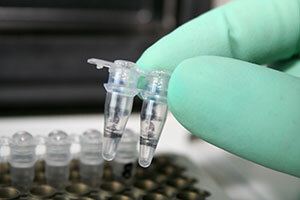 Using our proprietary primer sets covering all 44 V-segments and 14 J-segments for the T-cell Receptor beta (TCRbeta) CDR3 locus, plus an inbuilt contamination protection system, we amplify the T-cell repertoire and perform a deep sequencing step: Typically 1-2 million read-pairs per sample are generated. In the 2nd part of the TCRsafe-service, with an in-house developed software package HSDiagnomics processes and assembles raw reads into clusters and assigns V/J-segment IDs and CDR3 DNA and amino acid sequences. The result of our analysis sent out to customers is a table of clusters and frequencies, i.e. a high-resolution profile of TCRbeta. There are strong interests by researchers in academic and industry labs to perform analysis of T-cell response under various treatments in the mouse model system. HSDiagnomics addresses these needs by a proprietary mouse TCRsafe analysis. It is a thoroughly optimized quantitative TCRbeta assay, equipped with the same contamination protection system as the human TCRsafe kit. Besides using fresh tissue, blood and cultured cells, the assay can be also performed on formalin-fixed and paraffin-embedded tissues. Interested customers are welcome to contact us for more details. HSDiagnomics has processed hundreds of samples using its TCRsafe technology in research projects carried out with partners from academia. We are always interested in partnerships with research projects, both in academia and industry. As a service provider and partner we can offer our well tested technology for fast delivery of results and systematic tools to monitor and store results in a user-friendly way. Specific questions and needs of customer projects can be addressed by customized software modules. We are happy to discuss all relevant details with you – just give us a call!